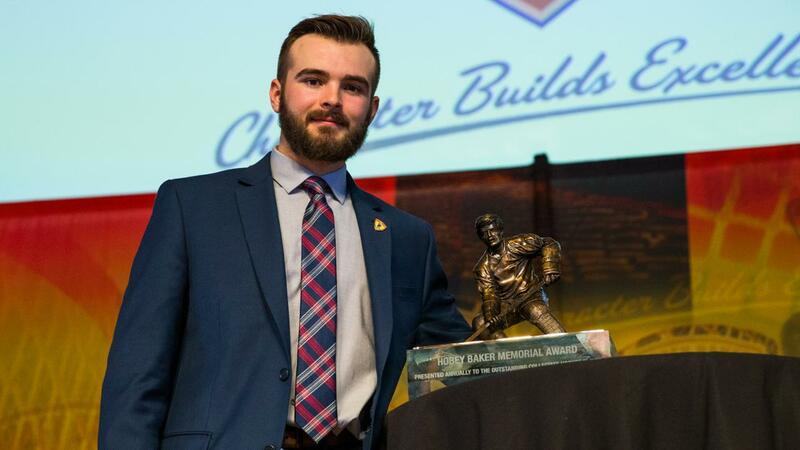 Hobey Baker Award recipient Will Butcher will announce Sunday which NHL organization will get his professional services. If baseball people think the dog days are in August, they should think again. This is the slowest section of the hockey calendar, although there’s always something going on. NHL GMs not still in vacay mode are tying up loose ends such as trying to decide how to dump salary to make room to extend the contract of one more RFA. Other GMs are plotting how to pick the pockets of their cap-heavy counterparts. Still others are negotiating with and, in some cases, signing free agents. For instance, 2017 Hobey Baker Award recipient Will Butcher, voted top player in NCAA Division I men's hockey, will choose an NHL team Sunday. As many as four teams hope to sign the high-scoring blueliner, including Buffalo and Vegas, according to agent Brian Bartlett. Butcher had seven goals and 30 assists in 43 games last season as a Denver senior and captain who helped the Pioneers earn the NCAA championship. He’s the first Hobey Baker defenseman since 2009. Butcher, now 22, was drafted by Colorado in the fifth round (123rd overall) four years ago, but never signed with the Avalanche and became a UFA on Aug. 16. College players can become UFAs on Aug. 16 of the fourth year after they were drafted. Although fans of the hapless 22-56-4 Avalanche will have to endure the sight of Butcher wearing another NHL team’s sweater, they did get some good news Thursday when forward Alex Kerfoot agreed to a two-year, entry-level contract with Colorado. The 23-year-old’s pedigree is in the same general ballpark as Butcher’s after Kerfoot was named one of the top-10 contenders for this year’s Hobey Baker Award. He got consideration thanks to a 16-goal, 29-assist, 36-game season as Harvard University captain. Fans of the New Jersey Devils, who drafted him in 2012’s fifth round, shared disappointment with supporters of the Canucks and Rangers, who negotiated unsuccessfully for Kerfoot’s UFA services. Florida’s AHL affiliate signed UFA Blaine Byron to a one-year AHL contract Friday. A sixth-round (179th overall) pick by the Pittsburgh Penguins in 2013, the center joined the Springfield Thunderbirds after a four-year collegiate stint with the University of Maine, serving as the Black Bears' assistant captain as a senior. The 6-1, 186-pound Byron had a team-high 18 goals and led the Black Bears with 41 points in just 36 games in 2016-17. During four years with Maine, Byron scored 46 goals and added 62 assists for 108 points in 145 NCAA contests, a .71 point-per-game clip. He also was minus-25, not as bad as you’d think considering the Bears hibernated their way to a 24-51-4 record for those four campaigns. Coming off by far the best of his four performances, the 22-year-old playmaker was expected to spurn contract offers from the Penguins and head to the free-agent market, perhaps dismayed by all the talented young forwards in Pittsburgh’s system, deepened by the recent signing of Hobey Baker finalist Zach Aston-Reese. While the Panthers have many forwards who can play center, they’re shy of ones such as Byron who have specialized in the middle. However, Alexsander Barkov, Vincent Trochek and Nick Bjugstad (the oldest of the trio at 25) are signed for at least the next four years, so Byron is going to have to wait his turn. That reality is reflected in his one-way AHL deal. Byron is potentially a top-six middleman, but he must prove himself in Springfield. Although the Sabres, Senators, Devils and Golden Knights were merely his four most-serious suitors, the fact Byron began his pro career with an AHL contract is not encouraging for poolies. The Blue Jackets acquired another four-year NCAA UFA earlier this week by signing D Doyle Somerby to a two-year, entry level contract. In four seasons at Boston University, the 6-5, 223-pounder amassed eight goals and 19 assists for 27 points with 160 PIMs and a cumulative plus-11 in 151 games. He was team captain during his senior season in 2016-17. Now 23, perhaps his finest individual moment was when he potted the winning goal in the national semi-final against North Dakota as BU reached the 2015 Frozen Four championship game. The New York Islanders took Somerby in the fifth round of the 2012 NHL entry draft. Speaking of the NYIs, they’ve loaned goaltending prospect Linus Söderström to HV71 of the Swedish Hockey League. The 20-year-old goalie is coming off an excellent SHL rookie campaign in which he helped his squad capture the league title. The Islanders are demonstrating patience with Söderström, who has Asperger’s Syndrome, especially since another of their top netminding prospects has committed to the KHL. Ilya Sorokin, a 2014 third-rounder, recently signed a three-year extension with CKSA Moskva. If you have either goalie in a keeper pool, you’re going to have to decide whether to be patient. Or not. This my final Ramblings column – for Saturdays anyway. I’m swapping days with fellow Dobber Prospects editor Kevin LeBlanc, whose Ramblings will appear here Saturdays beginning next weekend. My Ramblings will move to Wednesdays. While this is the slowest time of the hockey calendar, we’re a mere five and a half ways from the first for-real puck drop of the 2017-18 campaign. How many sleeps is that, anyway?